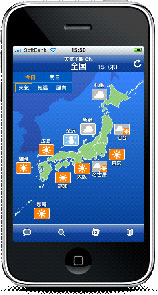 iPhone App “Weathernews Touch” Offers Intuitive Weather Info “one-touch” in Japan – Weathernews Inc.
Weathernews, Inc. (Tokyo, Japan - CEO: Chihito Kusabiraki) has released a native application for the iPhone in Japan called, “Weathernews Touch.” The Weathernews Touch application expands weather-driven risk communication services to a wider number of users. Available as a free download through the iTunes Store, the application allows users to get the latest local weather information through an intuitive touch screen interface. As of this release, the application features a “Weather Forecast Channel,” “Rain Cloud Channel” and “Satellite Channel.” More channels featuring seasonal and life-style enhancing content are to be added in the near future. Weather Forecast Channel provides text forecasts for all of Japan with easy to understand comments by professional forecasters by video. There is also a searchable pinpoint forecast giving users access to the latest weather anytime. With a tap or a flick on the touch-panel, users can select today or tomorrow’s forecast for anywhere in Japan to get the wind speed, air pressure, and precipitation. The application gives users a fun way to check the weather with one-touch. Pinpoint weather gives users the option to search for keywords and categories (train station, postal code, etc.) to find a detailed hourly, 3-hourly or weekly forecast. Video programs for the Hokkaido, Kanto, Chubu, Kinki, Chukoku, Shi-koku/Kyushu and Okinawa regions of Japan are available for people living in or traveling to these seven areas. Web camera feeds from locations around Japan are also available, letting user see the details of the actual weather conditions in real-time. Pro-forecasters explain the latest changes in the forecast and conditions with easy to understand comments. With one touch, the Rain Cloud Channel lets users zoom in/out on the map of Japan to see the state of rain clouds. Locations all over Japan can be selected at the regional, prefectural or city level. Users can also use a slider at the bottom of the screen to see cloud movements up to six hours ahead at 10 minute intervals. The speed of the cloud animation can be freely controlled by the speed users move the slider, and stopped at the point they want to see displayed. The channel allows users to see where and how much rain is falling, and also where it is predicted to fall. Tapping the comment icon shows comments from a forecaster in easy-to-understand language. A satellite view of clouds over a 12 hour period can be accessed with one tap through the Satellite Channel. Users can zoom in/out on different areas across Japan and change the level of magnification using the touch screen. Like the Rain Cloud Radar Channel, a slider lets users see an animated map of cloud movements across Japan from west to east. Satellite Channel allows users to check things like the development of low-pressure centers, snow carry clouds blowing in from the Sea of Japan in the winter, and typhoons in the summer. Comments from forecasters in simple language are available with a single tap. The Weather Forecast, Rain Cloud Radar and Satellite channels that are now available through Weathernews Touch have been designed to work together with the service content featured on the Weathernews website. Weathernews plans to expand Weathernews Touch with content that is directly beneficial to people’s lifestyles.